Abu Dhabi: Bangladeshi expatriates on Tuesday celebrated National Day, commemorating 49 years since Bangladesh achieved nation status. Gathering at the embassy before sunrise, residents watched a livestream of Bangladeshi Prime Minister Shaikh Hasina’s address to the nation. 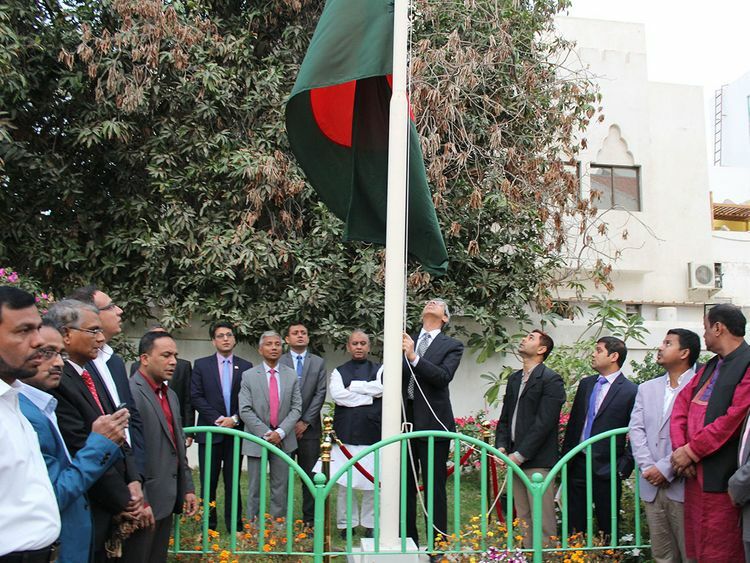 Bangladeshi Ambassador to the UAE, Mohammad Imran, then hoisted the flag, before calling upon the 800,000-strong community to represent, in the UAE, the humanitarian values of Bangladesh. Speaking to Gulf News, Imran said he also launched an ATM service for Janata Bank, the state-owned commercial bank of Bangladesh. “The introduction of ATMs will benefit thousands of account holders in the UAE. The ATMs will now be functional in the bank’s branches in Abu Dhabi, Al Ain and Sharjah,” Imran told Gulf News. Bangladesh was established as a nation in 1971. Since the UAE was born in the same year, the countries have historically shared strong ties with one another. The Bangladeshi disapora in the UAE is also basking in the positivity of Shaikh Hasina’s official visit last month (February), during which she signed agreements with UAE entities to establish an economic zone, as well as a number of ports and power plants. “A number of officials have also recently visited Chittagong, where a 110-acre plot was gifted to the UAE’s founder in 1984. There are now plans to set up a multi-specialty hospital there,” Imran said. At the same time, a number of Bangladeshi businessmen have also expressed interest to invest in the UAE. “We are also looking forward to a high-level from the UAE to Bangladesh very soon, and this will further boost the bonds between our countries,” Imran added. To commemorate the occasion, Bangladeshi students organised a series of performances at the Shaikh Khalifa Bin Zayed Bangladeshi Islamia School in Abu Dhabi. In the evening, community members gathered at a reception to celebrate the achievements of their nation.